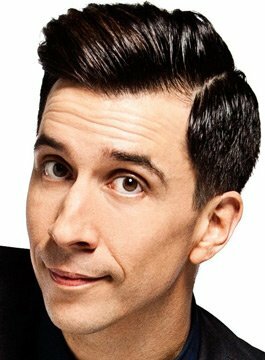 Award-winning stand-up, writer and performer Russell Kane has firmly established himself as one of the best comedians in the UK. In 2010 Russell won the Foster’s Edinburgh Comedy Award for his show ‘Smokescreens and Castles’ – the most prestigious award in Comedy – having been shortlisted for the award a total of 3 times including one nomination for Best Newcomer for his Edinburgh show, ‘The Theory of Pretension’. He made history as the first comedian to win both the Edinburgh Award and Melbourne Comedy Festival’s Barry Award in one year. His award-winning show Smokescreens & Castles was recorded in front of his home crowd in Westcliff-on-Sea’s at the Palace Theatre and released by Universal Pictures in 2011. As a presenter, Kane is best known as the host of BBC3’s Live at The Electric, with regular appearances on BBC1’s Live at the Apollo, BBC3’s Unzipped, ITV2’s Celebrity Juice and I’m A Celebrity Get Me Out of Here… Now! Russell also presents a radio show each Saturday mornings on Virgin Radio with Angela Scanlon. There is no end to his talents having published his first novel ‘The Humorist’ which was nominated for a literary prize, he has also written, directed and starred in three plays two of which have toured, and one, blank verse, which was performed in the main house of the RSC in Stratford-Upon-Avon. Famed for his critically acclaimed tours Russell has been performing sell-out shows across the globe. In his 2016 show ‘Right Man, Wrong Age‘ Russell Kane unleashes another blisteringly-funny, award-winning stand-up performance about growing up and growing down!